FabLab – digital fabrication laboratories – were set up to inspire people and entrepreneurs to turn their ideas into new products and prototypes by giving them access to a range of advanced digital manufacturing technology. Left: Learning Rhino 3D in order to make vinyl decals. Right: Laser cutting 3/4" bathroom passes for Koyuk Malimiut School. This fall we were able to add FabLabs at two sites. Both St. Michael and Stebbins are now rocking and rolling creating stickers, placks, guitars and whatever else they can imagine. 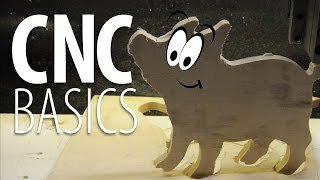 This video breaks down the steps on how a CNC machine works. CNC Dummies For RoutersEdpuzzle video lesson. Make any video your lesson. Take a video and crop it, add your voice or embed questions at any point.